Background Gonarthrosis in the relatively young and active population causes major daily discomfort and disability. If the arthritic process is mainly limited to the medial compartment, the axis of a varus knee can be realigned laterally with high tibial osteotomy (HTO) to unload the medial compartment and allow some cartilage regeneration and pain relief. Many techniques have been developed (i.e. closing wedge, opening wedge, dome, and ‘en chevron’ osteotomies), but opening (medial) and closing (lateral) wedge osteotomies are the most commonly used. With opening wedge HTO, good long-term results are obtained with a correct patient selection (a young patient<60 years of age, isolated medial osteoarthritis, and with good range of motion and without ligamentous instability) and a precise surgical technique. This study describes the outcomes of patients who underwent opening wedge HTO using Puddu plate. Aim The aim of this study was to confirm that medial opening wedge HTO with Puddu plate fixation can be a reliable procedure for the treatment of medial compartment osteoarthritis of the knee associated with varus deformity. Patient and methods With meticulous patient selection, an open-wedge HTO using the Puddu plate was performed in 15 knees of 15 patients at El-Sahil Teaching Hospital between May 2010 and March 2013 for a young patient population (<60 years of age) with isolated medial osteoarthritis, with good range of motion, and without ligamentous instability. There were four women and 11 men. Overall, nine patients were affected in the left knee and six in the right. Their mean age was 25.4 years. The average varus angle to be corrected was 8.13. Results All of the patients were followed up for an average of 12 months (8–16 months). There was no nonunion or delayed union in this group, and all patients were encouraged to start full weight-bearing after 6 or 8 weeks. The overall fineness rate was 80% (12/15) at the end of the follow-up with improved symptoms. Two cases of wound infection were treated with antibiotic and daily dressing. One case of deep vein thrombosis was treated satisfactorily with medical therapy. Two had patients had undercorrection, two patients need cancellous bone graft, and three patients needed postoperative casting. Conclusion With meticulous patient selection, medial opening HTO using the Puddu plate has a very high success rate. The benefits of this technique is the short time of operation in comparison with other techniques, no graft used, and no casting postoperatively because the Puddu plate gives rigid fixation, which leads to early range of motion in the knee. Knee osteoarthritis, a musculoskeletal disorder, is considered the leading reason of disability in the elderly population. It afflicts 1% of men and 0.9% of women by the age of early 50 years, increasing to 2% of men and 6.6% of women by 70 years of age . Varus deformity of the knee joint is fairly common and causes an abnormal distribution of the weight-bearing stresses within the joint. The stress is concentrated medially, accelerating degenerative changes in the medial compartment of the joint . A variety of procedures have been described for the treatment of medial compartment osteoarthritic knee, ranging from arthroscopic lavage and debridement, unicompartmental arthroplasty to total knee arthroplasty. High tibial osteotomy (HTO) is a widely performed procedure to treat medial knee arthrosis. The principle of correcting malalignment is to transfer load to the relatively normal compartment of the knee to relieve symptoms and suppress the disease progression. Many techniques have been developed (i.e. closing wedge, opening wedge, dome, and ‘en chevron’ osteotomies), but opening (medial) and closing (lateral) wedge osteotomies are the most commonly used . Lateral closing wedge HTO has been considered for a long time as the gold standard in treating medial knee osteoarthritis. However, this technique leads to (i) fibular osteotomy or proximal tibiofibular joint disruption, (ii) lateral muscle detachment, (iii) peroneal nerve dissection, (iv) more demanding subsequent total joint replacement (TKR), and (v) bone stock loss. For all these reasons, the opening wedge HTO has gained popularity and has become a widely used alternative option . The advantages of opening wedge over closing wedge include the following: (i) restoration of anatomy with or without addition of bone to the diseased medial side, (ii) the ability to achieve predictable correction in both coronal and sagittal planes, (iii) the ability to adjust correction intraoperatively, (iv) the requirement for only one bone cut, (v) avoidance of proximal tibiofibular joint disruption and invasion of the lateral compartment, (vi) and the relative ease of combining with other procedures such as anterior cruciate ligament (ACL) reconstruction. The disadvantages of this procedure include (a) the creation of a defect that requires bone graft with attendant harvest morbidity, (b) a theoretical higher risk of nonunion, and (c) the longer period of restricted weight-bearing postoperatively . Here, we present indications, preoperative planning, and technical details of a medial opening wedge procedure according to the technique developed . 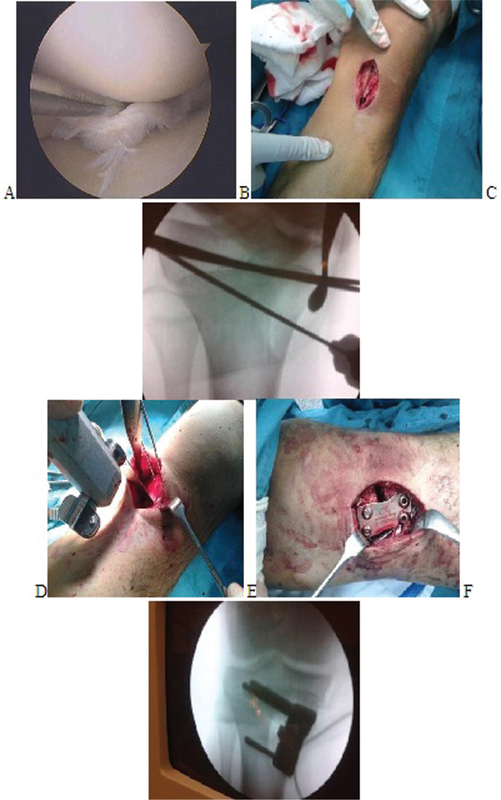 Between May 2010 and March 2013, 15 knees in 15 patients underwent an opening wedge HTO, and a Puddu plate was used for internal fixation at El-Sahil Teaching Hospital. The study was approved by the local ethical committee, El-Sahil Teaching Hospital, Cairo, Egypt and all patients were consented. We aimed to shift the tibiofemoral angle to a degree that would place the mechanical axis at the middle of the lateral compartment. Patients included in this study were younger than 60 years with symptomatic osteoarthritis of the medial compartment, intact lateral compartment, genu varum, good range of motion (ROM) (i.e. flexion>90° and flexion contracture<10°), and without ligamentous instability. Preoperative planning was performed using standing radiographs of the knee to calculate the tibiofemoral angle. There were four women and 11 men, with a mean age of 25.4 years at surgery. The average varus angle to be corrected was 8.13. The affected side was left knee in nine patients and right knee in six patients. Patients with combined medial and lateral arthrosis, flexion contracture greater than 20°, lack of flexion beyond 90°, and instability allowing the tibia to subluxate more than 1 cm were excluded. The presence of patellofemoral arthrosis was not considered an absolute contraindication. An arthroscopic evaluation and treatment of intra-articular pathologies were undertaken before the osteotomy. Nine patients had prior surgical arthroscopy. No significant chondral damage (i.e. >grade 1 according to the International Cartilage Repair Society classification) to the lateral compartment was present in any of the prior arthroscopies. Of these, six had partial medial meniscectomy. In addition, two patients who were not operated on before required arthroscopic partial medial meniscectomy at the operation. No patient had lateral menisectomy. Age: patients younger than 60 years were an ideal candidate; moreover, older patients who are ‘physiologically young’ in relatively good health and have an active life style can be strong candidates for HTO. Whereas for a patient older than 60 years with a sedentary with similar disease, TKR would usually be more appropriate. Regarding type and location of arthritis, HTO has been more successful in medial unicompartmental osteoarthritis . Degree of varus deformity: the results are best when deformity is equal to or less than 10°, and it is worse when the deformity is more than 15°. Stability: less than 10° of deformity gives stable knee whereas more than 10° renders the knee unstable, and more than 15° of the deformity can be expected to undermine the result of osteotomy . ROM: flexion contracture should not exceed 20° and ROM should be 100° without extension lag . Weight: body weight more than 30% over ideal is a relative contraindication for HTO . Tibiofemoral subluxation: subluxation greater than 1 cm is an absolute contraindication to corrective osteotomy . Activity level: intensive laborers who wish to continue participation in athletic activities are better suited for osteotomy than arthroplasty. Bone quality: bone quality must be adequate to hold fixation and not undergo collapse. Patient personality: osteotomy patients need to understand the natural history of their disease and the goals of osteotomy. Contraindications: compromised healing, neurological impairment, no compliance, inflammatory arthritis along with severe varicose veins, arterial insufficiency, and any other physical disability that seriously hinders rehabilitation are contraindications to osteotomy . Anteroposterior standing radiographs including hip, knee, and ankle joints. Valgus stress radiograph will correct the varus knees few degrees, so planned osteotomy should be decreased by the same amount to prevent excessive overcorrection . Close-up views of the knee before osteotomy, including anteroposterior, lateral, tangential (sunrise), and tunnel (intercodylar) views. Figure 1 Axes and angles in the lower extremity. TF, tibial femoral angle . (a) Mechanical axis is 3° of valgus from the vertical axis. (b) Femoral shaft axis is in 6° of mechanical axis . Deformity is present when there is mechanical axis deviation. Varus deformity is the angle between mechanical axis of the femur and mechanical axis of the tibia. Moreover, tibia is the source of varus deformity when proximal medial tibial angle is less than 87° while lateral distal femoral angle is normal . The postoperative mechanical axis should be such that the hip-knee-ankle line intersects the knee at a point 30–40% of the width of the lateral plateau. This corresponds to valgus angulations from the mechanical axis of 3°–6°, or a femorotibial angle of ∼10°–13°. The angle of correction should equal the tibiofemoral angle and add an overcorrection of 2°–4°. Preoperative arthroscopy should be used to assess the status of other compartments in patients who are considered for HTO, and also, for diagnosis, grading, and treatment (arthroscopic debridement and osteoplasty) of osteoarthritic involvement of the cartilaginous surfaces of contralateral compartment and of the patellofemoral joint. The amount of involvement influences the decision of an osteotomy versus a TKR. Direct visualization is far more reliable than any radiographic film, which requires complicated calculations . Closing wedge osteotomies proximal to the tibial tuberosity . Closing wedge osteotomies distal to the tibial tuberosity. Closing wedge osteotomies behind tibia tuberosity . Each of the aforementioned techniques has its advantages and disadvantages. However, we choose to investigate a medial opening wedge procedure according to the technique together with new instruments and plates . Puddu plate design: The plates specially designed for this osteotomy are butterfly shaped with four holes for the tibia. Their peculiarity is a spacer, a tooth as it were, available in many different sizes from 5 to 17.5 mm in thickness ([Figure 2]). Innovative new plates, forged in a special titanium alloy, are now available. Through them, screws can be freely orientated in every preferred direction and then locked in the plate, like in a sort of internal mini-fixator; moreover, cortical and cancellous screws for the new plates, also of titanium alloy, are now available. The crucial point of the operation is the opening of the metaphysis, where the osteotomy has cut the bone, at the desired angle of correction to allow introduction of the plate tooth. Figure 2 (a–c) Shape of puddu plate. Operation was done under general or spinal anesthesia according to the following steps ([Figure 3]). Step 1: The patient is draped as usual as in knee surgery with the C-arm of an image intensifier. The tourniquet was inflated. Step 2: arthroscopy is done to assess lateral tibiofemoral and patellofemoral joint and to do appropriate joint surface debridement, partial meniscectomy, or loose body removal if needed. Step 3: incision is performed for exposure of 6–8 cm of vertical skin incision along the medial border of the anterior tibial tubercle. A blunt retractor is placed dorsally, deep to the collateral ligament, to protect the posterior vessels and expose the posteromedial corner of the tibia. Anteriorly, a second retractor was placed under the patellar tendon. The procedure is facilitated by flexion of the knee. Step 4: for osteotomy, two Kirschner-wires (3 mm) were placed 1–2 cm distal and parallel to the joint line and another Kirschner-wire (2.4 mm) was introduced at an appropriate angle up to the lateral cortex, and then with an oscillating saw, below and parallel to the guide pin, the osteotomy was performed to cut the medial cortex only. A sharp osteotome was used to finish the osteotomy under fluoroscopic control, confirming that all the cancellous metaphysis were completely interrupted, but preserving a far hinge of ∼0.5 cm of intact bone. The wedge opener was introduced and slowly advanced until the osteotomy was opened to obtain the planned realignment of the knee. The surgeon measured the dimension of bone gap directly on the graduated tines of the wedge opener and chose the plate. Step 5: for plate fixation, the plate could then be changed as needed after measuring the mechanical axis with a special guide rod. The plate was then fixed with two proximal (6.5 mm cancellous) and two distal (4.5 mm cortical) screws. Figure 3 (a) Arthroscopic evaluation. (b) Incision. (c) Kirschner-wire placement under image. (d) Osteotomy, (e) Puddu placement, (f) Puddu plate image. After the closure of the layers and placement of a drain, the patient’s knee was put into a hinged immobilizer. The patients were allowed to move the knee in bed 48 h after surgery, and from the third day, passive knee motion was permitted and then were allowed to walk without weight-bearing avoiding the flexion with rotation stress. In some cases, the use of continuous passive motion machine to ease movements and or knee hinged immobilizer in patient transportation. Nearly at 4 weeks, the patient is pain free with full ROM and allowed to partially weight-bear (30% of the body weight). When radiographs of the knee demonstrate healing of the osteotomy and no lysis zones or instability signs, full weight-bearing without crutches was allowed at nearly 3 months. All of the patients were followed up for an average of 12 months (8–16 months). There was no nonunion or delayed union in this group, and all patients were encouraged to start full weight-bearing after 6 or 8 weeks. The lateral cortical bridge of the osteotomy demonstrated partial callus formation in some patients, and the osteotomy was still partially open on the medial side and were healed in 12–16 weeks. No complications like plate broken, nerve injury, or blood vessel injury occurred. Two patients had superficially delayed healing of the incision, but they healed after dressings were changed. No tendonitis of the pes anserinus was found, and no medial instability was recorded after surgery. The average varus angle to be corrected was 8.13°. The postoperative average corrected degree was 12.26° (10°–17°) compared with the varus deformity before surgery. During follow-up, the weight-bearing lines of the lower extremities maintained the level after operation, and no degenerations developed in the three compartments of the knee. The overall fineness rate was 80% (12/15) at the end of follow-up with improved symptoms. The subjective satisfactory survey demonstrated that ∼80% patients showed satisfactory on the operation, although 15% patients still had residual symptoms such as pain and locking. Most of these patients thought that they would re-select this surgery if possible, based on the therapy process and ultimate results. Hospital for Special Surgery Knee Score was obtained for each patient monthly till the sixth month postoperatively. On the contrary, undercorrection was observed in one case that was corrected to 3° varus and the other to 3° valgus. Insertion of a cancellous bone graft was applied to two patients as the osteotomy gap was more than 12.5 mm, which means that a good selection of patients for corrective osteotomy without graft is mandatory. During arthroscopic examination, arthrosis was observed in 6 patients within the medial compartment and managed arthroscopically. Cartilagenous tissue in the lateral compartment was intact and of good quality. Mean duration of preoperative pain and disability was 4.8±5.1 years. Patients were offered surgery if they had a varus knee deformity and their knee symptoms persisted despite conservative treatment. Nine patients had prior surgical arthroscopy. No significant chondral damage (i.e. >grade 1 according to the International Cartilage Repair Society classification) to the lateral compartment was present in any of the prior arthroscopies. Of these, six had partial medial meniscectomy. In addition, two patients who were not operated on before requiring arthroscopic partial medial meniscectomy as the index operation. No patient had lateral menisectomy ([Figure 4] and [Figure 5], [Table 1]). Figure 4 (a) Left genu varum preoperatively, (b) narrowing of joint space medially, (c) anteroposterior view postoperatively with equal joint spaces, and (d) anteroposterior view postoperatively with healed osteotomy site after 12 weeks. Figure 5 (a) Right genu varum preoperative, (b) scanogram of both lower limbs showing varus angle and length of lower limbs, (c) posterior horn medial meniscus tear by arthroscopy, (d) postoperative anteroposterior view, and (e) anteroposterior view postoperative with healed osteotomy site after 12 weeks. Varus gonarthrosis is one of the most frequently encountered abnormalities currently seen by orthopedic surgeons. Inflammatory diseases, traumas, disorders of the articular cartilage, and varus malalignment are responsible for this deformity. Akamatsu et al. in their series consisting of 144 knees, detected that mineral densities and sclerosis of medial femoral condyles and tibial bone plateau are denser than those of the lateral compartment. They performed HTO for 23 patients and stated that the degree of bone mineral density and sclerosis decreased by distributing mechanical stress evenly and diminishing weight-bearing forces impinging on medial compartment . Moreover, 94 untreated knees with medial arthrosis were followed up radiologically for 10–18 years, and arthrosis was detected to have been deteriorated at the end of the follow-up period. Although the patient’s age is an important criterion for classical HTO indication, nowadays chronological age per se is not accepted as a criterion for eligibility. Bone texture, daily activity level, and biological age have a greater effect on selection criteria. Gonarthrosis in the relatively young and active population causes major daily discomfort and disability. If the arthritic process is mainly limited to the medial compartment, the axis of a varus knee can be realigned laterally with HTO to unload the medial compartment and allow some cartilage regeneration and pain relief . For active unicompartmental osteoarthritis in patients younger than 55 years, an osteotomy is generally a better choice owing to a better ROM and a better proprioception that allows an active life. Conversion to knee arthroplasty is still possible, when the degeneration deteriorates . 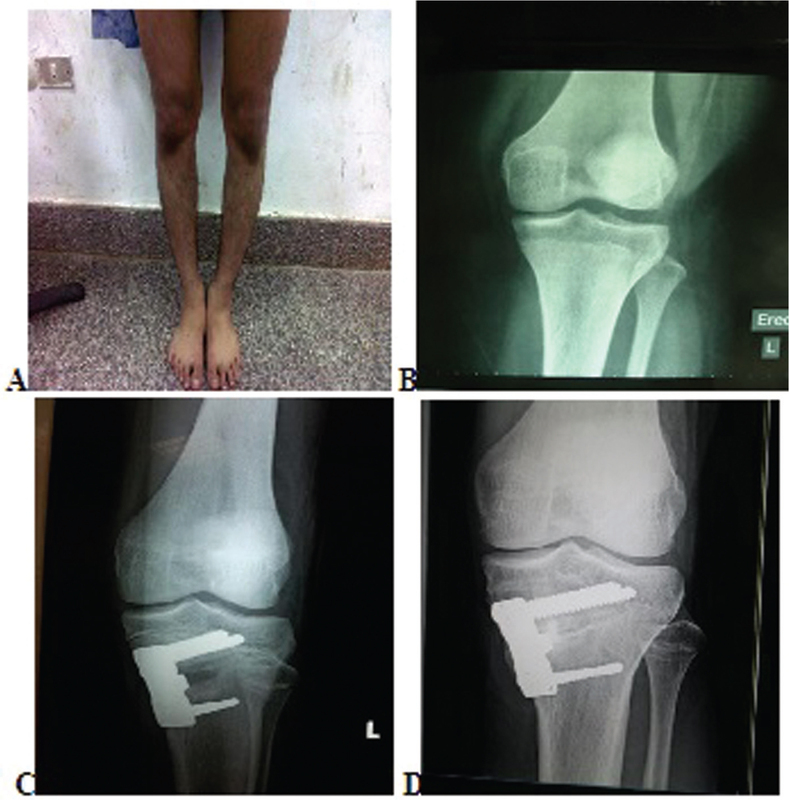 The factors which will increase the rate of success obtained from HTO using Puddu plate without graft procedures include presence of isolated medial compartment arthrosis, good patient motivation to comply with postoperative rehabilitation program, patients aged younger than 60 years, absence of knee contractures and excessive patellofemoral arthrosis, ROM being at least 90–100°, varus gonarthrosis requiring less than 10° correction, stable knees, and the usage of rigid fixation material. With HTO, lesser weight-bearing impact on subchondral bone, decrease of intraosseous venous hypertension and microfractures involving subchondral bone, alleviation of clinical symptoms such as pain, and consequently improvement in functional status of the patients are targeted. Medial opening wedge HTOs have become increasingly popular over the past two decades. The procedure is attractive because the peroneal nerve is not in jeopardy, and disruption of the proximal tibiofibular joint and lateral ligaments is avoided . The theoretical advantages of opening wedge over closing wedge include the following: restoration of anatomy with or without addition of bone to the diseased medial side, the ability to achieve predictable correction in both coronal and sagittal planes, the ability to adjust correction intraoperatively, the requirement for only one bone cut, avoidance of proximal tibiofibular joint disruption and invasion of the lateral compartment, and the relative ease of combining with other procedures such as ACL reconstruction. The disadvantages of this procedure include the creation of a defect that requires bone graft with attendant harvest morbidity, and a theoretical higher risk of nonunion, as well as the longer period of restricted weight-bearing postoperatively. Associated laxity of the ACL or posterolateral corner is not uncommon in patients with medial gonarthrosis, and disruption of the proximal tibiofibular joint as commonly performed during lateral closing wedge HTOs may effectively lengthen the posterolateral corner and lead to increased instability . Success in medial opening wedge osteotomy depends largely on sound application of the technique. The determination of the exact localization of the osteotomy site accurately under a good fluoroscopic control, meticulous care not to fracture lateral cortex during opening of the osteotomy site, frequent assessment of the correction angle at every step of the operation, avoidance of overcorrection, and the selection of an appropriate Puddu plate size fit for the osteotomy gap are important details increasing the success rate of this procedure. Preoperative Hospital for Special Surgery Knee Score was deemed ‘worse’, and postoperative scores was ‘good’. One of the most important complications reported for either closing or opening wedge osteotomies is patella infra or alta. Based on postoperative Insall-Salvati index, we did not encounter either patella infra or patella alta in our patient group . In our study group, mechanical axes passed through 5.09 laterally, and we obtained a median 5° valgus position. We believe that this approach had a favorable effect on the early improvement of functional status, and also thought that it might prevent the deterioration of arthrosis owing to the even distribution of mechanical weight-bearing forces in the long run. However, early results obtained indicate that medial opening wedge osteotomies using Puddu plates could be realized safely with considerable success with encouraging outcomes, and this technique could be a good alternative for unicompartmental total knee arthroplasty. Comparative studies with longer follow-up periods will be required to demonstrate its favorable effects on arthrosis in the long term. The treatment of unicompartmental osteoarthritis of the knee remains a challenge to the orthopedic surgeon. The causes are varied and the therapeutic options are numerous. When nonoperative and arthroscopic procedures fail and the patient is considered too young for unicompartmental or TKR, osteotomy is the standard operation in the orthopedic armamentarium to treat the axial deformities of the knee and subsequent unicompartmental osteoarthritis . Tibial plates with trapezoidal spacers are available to permit the correction of the coronal and, eventually, the sagittal deformity, the so-called tibial posterior slope, at one surgical session. The new femoral and tibial plates will have increasing tooth sizes in single-millimeter increments (J. Puddu, Personal Communication). Varus malalignment is a common deformity associated with medial compartmental osteoarthritic knee, and there are many surgical techniques for correction of varus tibia. With medial opening wedge tibial osteotomy using the Puddu plate, the success rate will be very high, owing to short time of operation, no graft used, no casting postoperatively, early ROM of the knee, no change of patellar height or posterior tibial slope, full correction of preoperative deformity, and cure of medial knee pain. Zhang HN, Zhang J, Lv CY, Leng P, Wang YZ, Wang XD, Wang CY. Modified biplanar open wedge tibial osteotomy with rigid locking plate to treat varus knee. J Zhejiang Univ Sci B 2009; 10:689–695. Paley D, Maar DC, Herzenberg JE. New concepts in high tibial osteotomy for medial compartment osteoarthritis. Orthop Clin North Am 1994; 25:483. Amendola A, Bonasia DE. Results of high tibial osteotomy: review of the literature. Int Orthop 2010; 34:155–160. Barak H, Shlomo B, Ran T, Amos K, Rafael T. Mid-term outcome of opening-wedge high tibial osteotomy for varus arthritic knees. Orthopedics 2012; 35:192–196. Amendola A, Fowler PJ, Litchfield R, Kirkley S, Clatworthy M. Opening wedge high tibial osteotomy using a novel technique: early results and complications. J Knee Surg 2004; 17:164–169. Takaaki T. Opening wedge high tibial osteotomy using a Puddu plate and beta tricalcium phosphate blocks. Tech Orthop 2013; 28:185–190. Korn MW. Knee surgery. High tibial osteotomy. New York: Springer-Verlag Berlin Heidelberg; 2001. pp. 288–300. Insall JN. Insall: Surgical pathology of osteoarthritis. Surgery of the knee. 2nd ed. New York: Churchill Livingstone; 1993. pp. 577–583. Akizuki S, Shibakawa A, Takizawa T, Yamazaki I, Horiuchi H. The long-term outcome of high tibial osteotomy: a ten- to 20-year follow-up. J Bone Joint Surg Br 2008; 90:592–596. Coventry MB. Current concepts review: upper tibial osteotomy for osteoarthritis. J Bone Joint Surg 1985; 67[A]: 1136. Berman AT, Bosacco SJ, Kirschner S. Factors influencing long term results in tibial osteotomy. Clin Orthop 1991; 22:192. Jacob RP, Murphy SB. Tibial osteotomy for varus gonarthrosis: indication, planning and operative technique. Instr Course Lect 1992; 41:87–93. Krackow KA. The measurements and analysis of axial deformity at the knee. The Homer Stryker Center. New York: UB Orthopaedics; 2001. pp. 7–15. Perry J. Gait analysis: normal and pathological function. Thorofare, NJ: Slack Inc; 1992. Roskydal Z, Kura V, Ondrusek S. The arthroscopic debridement in the management of osteoarthritis of the knee joint by high tibial osteotomy. Bratisl Lek Listy 2003; 11:362–366. Coventry MB, Ilstrup DM, Walrichs SL. Proximal tibial osteotomy. A critical long-term follow-up study of eigthy-seven cases. 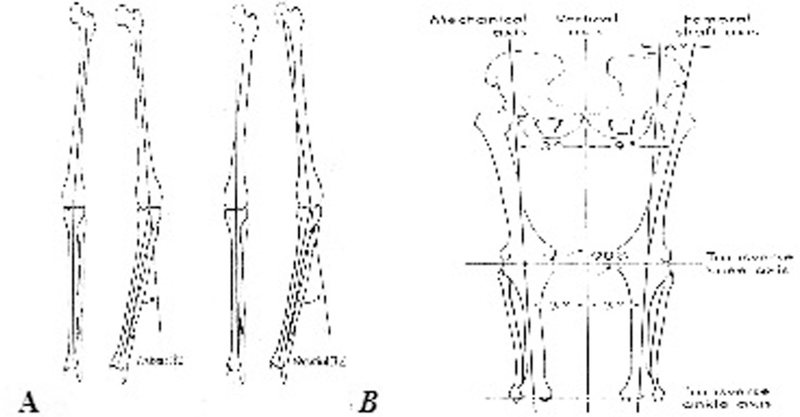 J Bone Joint Surg Am 1993; 75:196–201. Hernigou P, Medevill D, Debeyre J, Goutallier D. Proximal tibial osteotomy with varus deformity: a ten to thirteen year follow-up study. J Bone Joint Surg Am 1987; 69:332–354. Maquet P. Valgus osteotomy for osteoarthritis of the knee. Clin Orthop 1976; 120:143. Akamatsu Y, Koshino T, Saito T, Wada J. Changes in osteosclerosis of the osteoarthritic knee after high tibial osteotomy. Clin Orthop 1997; 334:207–214. Brittberg M, Winalski CS. Evaluation of cartilage injuries and repair. J Bone Joint Surg Am 2003; 85(Suppl 2):58–69. Spahn G. Complications in high tibial (medial opening wedge) osteotomy. Arch Orthop Trauma Surg 2004; 124:649–653. Insall JN. editor. Surgery of the knee. 2nd ed. Tibial osteotomy. New York, Edinburg, London: Churchill livingstone; 1984. p. 551. Catagni MA, Guerreshi F, Ahmad TS, Cattaneo R. Treatment of genu varum in medial compartment osteoarthritis of the knee using the ilizarov method. Orthop Clin North Am 1994; 23:509–514.